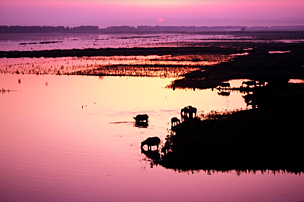 The world now boasts its first Ramsar Wetland Cities. Eighteen cities from seven countries – China, France, Hungary, Madagascar, South Korea, Sri Lanka and Tunisia – received the prestigious accreditation during a boisterous ceremony at the 13th Conference of the Parties to the Ramsar Convention on Wetlands (COP13) in Dubai. This flagship ceremony was the culmination of a process that began back in 2012 – a process that WWF has supported wholeheartedly since the start, including backing the adoption of the Wetland Cities resolution at COP12 in Uruguay. The Wetland City Accreditation scheme encourages cities in close proximity to and dependent on wetlands – especially designated Ramsar Wetlands of International Importance – to promote the conservation and wise use of urban and peri-urban wetlands, as well as sustainable socio-economic benefits for local people. This initiative also represents a direct link between Sustainable Development Goal 11 – “Make cities and human settlements inclusive, safe, resilient and sustainable” – and SDG6 – “Ensure availability and sustainable management of water and sanitation for all”. “Healthy wetlands are a critical to resilient, sustainable cities in the face of climate change, as they provide the best natural defence against extreme floods and storm surges as well as filtering water for people and businesses,” said Dean Muruven, Head of WWF Delegation at COP13. 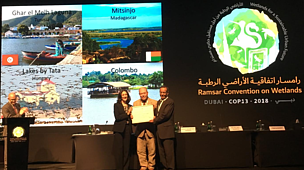 “WWF supported a number of these cities to secure Wetland City Accreditation and look forward to working with other cities around the world to conserve and restore their wetlands – and subsequently join this prestigious list of Ramsar wetland cities,” added Muruven. WWF worked with the city authorities and communities in the Tunisian city of Ghar el Melh, which inspired this transformational intiative, and in three Chinese cities – Changde, Changshu and Haerbin, which boast a combined population of 23 million. 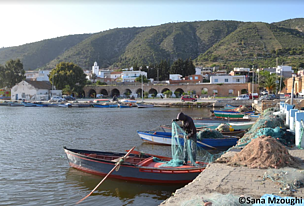 “These pioneer cities have taken exceptional steps to safeguard their urban wetlands and will serve as examples and inspire other cities towards sustainable urbanization,” said Martha Rojas Urrego, Secretary General of the Ramsar Convention, during the ceremony.